While we are sure to get a lot of inspiration and have interesting personal encounters during our Innovation Roadtrips, we know there is an awful lot of great literature about innovation, change and creativity out there. We haven’t read it all (it would probably take a lifetime to do so), but we did our fair share of reading in recent years. Here are some favorites we can definitely recommend, in random order. All are available in several languages and as paper- or Ebooks. Be warned, the list will have a light to medium Stanford bias, due to the time we spent there – feel free to add more East Coast or non-US books. What are your favorite reads? We’d love to hear your suggestions! Tina Seelig is one of Stanfords most famous professors in the field of creativity and innovation. While this book is not strictly about innovation, it still belongs on this list. It is a book about people who think out of the box, challenge their assumptions, do the unexpected. It’s full of funny and insightful examples of people learning to find their path in life and on the job, and it will most likely leave you feeling better about your own decisions, struggles and failures. The Heath brothers have a habit of writing books together, and several of them are worthy of getting a place on your shelf. This one is already a classic, and it asks (and answers) the question: Why is it so hard to make lasting changes in our companies, in our communities, and in our own lives? In short: While our rational mind understands we need to change, our emotional mind needs convincing. What do Frank Zappa, Henry Miller, Leonardo Da Vinci and Mary Shelley have in common? They all pondered over the power of innovation, and their essays, together with 35 others, are collected in this book. It’s incredible to see how the general assumptions and challenges of the human mind don’t change over the course of centuries. The single most powerful element this book names as the driver of change: Serendipity. This is basically the bible of innovation, if you had to pick one. 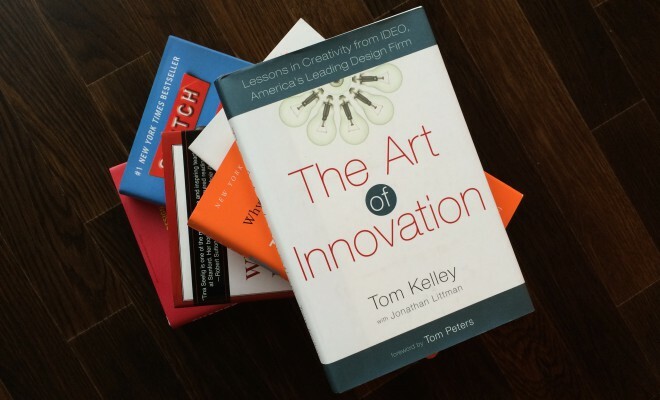 Already a classic, published in 2001, the book shows how Tom Kelley created an empire around innovation techniques at IDEO. Yes, it sometimes sounds like a religious cult. And yes, the approaches IDEO took are already widely known today. But still: The method that relies strongly on collaboration, user centered design, brainstorming and early prototyping is successful – and well worth the read. If you work in an organization – from supermarket to hospital, from agency to media organization – you are likely to be familiar with the difficulties of changing runnning systems. While Tim Brown also works with the IDEO method, being the CEO there, this book is much more hands on than the “Art of Innovation”. It gives you examples how change in you environment might work and how Design Thinking methods can help you drive it. Let’s get down to business. You are in a leadership position at a company that is doing great, and you want to insure that it will stay on top of it’s game by trying to stay just the way you are? Well, good luck. If Clayton Christensen is right, not making any mistakes will not help. He makes the point that great companies can fail precisely because they do everything right – unless they manage to drive disruptive innovation in their field. If you read a lot about innovation, you can sometimes get the feeling that many books and essays consist of theoretical phrases rather than hands on examples, and this might become frustrating. Steven Johnson wrote a book that is much more entertaining and practical than many others in the field. It tells the story of famous ideas, where they came from and how they finally became services or products that changed our lives: The pencil. the flush toilet. The hashtag. The steam engine. You name it.